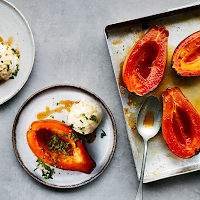 Roasting any fruit intensifies its sweet flavour, and papaya is a delicious example of this, particularly when sprinkled with sugar to create a lovely caramelised edge. 1. Preheat the oven to 220°C, gas mark 7. Halve the papayas and scoop out the seeds with a teaspoon. Arrange cut-side up on a baking tray and squeeze over the lime juice. Sprinkle over the sugar and roast for 15-20 minutes. 2. Serve half a papaya per person with a scoop of ice cream and a scattering of shredded mint. Try serving with Waitrose 1 Malaysian Coconut & Lime Ice Cream instead of classic vanilla for an extra tropical touch.